By providing multiple adjustments and combinations, the helmet can be tailored to fit personal preferences and comfort settings. Made of fire retardant material with high intensity, lightweight and comfortable to wear. UV protection is good for protect your eyes and skin. Auto-darkening, protect the eyes and faces from spark, spatter. 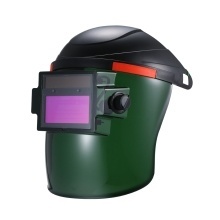 Overall-process protection against ultraviolet(UV) and infrared(IR) radiation. Quick response from clear to dark when start welding. The shell adopts PP material, with high and low temperature resistant. Corrosion resistand, flame retardant, high intensity and sturdy. Adjustable he-adband provides a comfortable no-slip fit. Light weight design is easy to handle and no pressure when you are working. 1. Do not allow any water entering into the product, otherwise it will cause permanent damage. 2. Please allow 0.5-1" error due to manual measurement. Thanks for your understanding.